Centrifugal pumps are essential to modern life. They ensure safe water for entire communities and help produce the fuel we need to power our vehicles. They also play key roles in chemical production, medical research, and the food and beverage industry. In any of these environments, a broken pump can have serious consequences. Yet too many enterprises run equipment well past manufacturers’ specifications, which can jeopardize their operations. Writing in a recent issue of Pumps & Systems magazine, Brandon Rudy, a senior instrumentation engineer for WIKA, outlines key basics on how centrifugal pumps operate, guidelines for optimal performance and care, and the key role instrumentation plays in signaling smooth operation—or potential failure. For starters, every pump has a proverbial “sweet spot” where it achieves optimal efficiency and performance with minimal stress on internal components. For most pumps, the optimum range is 10 to 15% of their best efficiency point (BEP). Operating outside those parameters will dramatically increase the likelihood of pump failure. Why is pump failure imminent? Because vibration is inevitable in all centrifugal pumps. Running a pump too sluggishly or too fast increases vibration and wears out internal components more quickly. Operating near the BEP keeps vibration to a minimum. Installing pressure gauges for predictive maintenance and troubleshooting can protect your centrifugal pumps. Gauges can pinpoint the cause of sluggishness in pumps, preventing costly repairs and downtime. Another key metric to monitor is a pump’s net positive suction head (NPSH), which measures the likelihood that a fluid will remain liquid. In practical terms, the NPSH for a centrifugal pump is the force required to keep fluid from vaporizing as it passes through a pump’s impeller. A suction pressure gauge is the most practical and accurate device to measure NPSH. Pressure gauges are essential at other pumping points. For instance, installing a pressure gauge upstream of a pump’s suction gauge can help crews to identify when a centrifugal pump’s suction strainer is becoming clogged. Ideally, the readings on both gauges should be identical; if there’s a mismatch, a clog might be the culprit. Moreover, mechanical seals are one of the most common failure points in a centrifugal pump. Accordingly, close attention must be paid to instrumentation on seal support systems—particularly external flushes, steam quenches, seal pots, circulators, and gas panels. As a member of WIKA’s Full Audit Service Team (FAST), Rudy has worked on numerous Instrument Audits for a variety of processing plants where hundreds of centrifugal pumps are in operation. He notes that these audits have found pressure gauges to be installed on fewer than 30% of centrifugal pumps. Consequently, significant improvement can be made simply by outfitting more centrifugal pumps and their peripheral systems with appropriate pressure gauges. Never forget, however, that no amount of instrumentation will perform its role adequately if not adequately monitored by skilled people. Pump operators, technicians, and all other plant personnel need training in the proper reading and interpretation of pressure gauges. This predictive maintenance gives people the ability to spot problems before they lead to unplanned downtime. 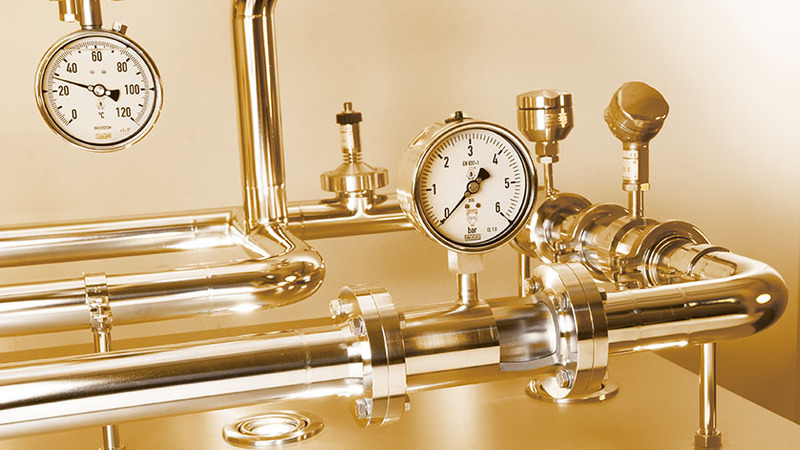 How do pressure gauges fit into my reliability initiatives?